Climate change related hydrological events. Rain bombs. These are somewhat uncomfortable subjects. But it’s a basic fact that if you warm the Earth, you also crank up rates of evaporation and precipitation. And since we’ve warmed the Earth by about 1.2 C above preindustrial levels by burning fossil fuels and dumping so much carbon into the atmosphere, we’ve loaded the climate dice for producing both more extreme rainfall and more extreme drought events. In the mid-Atlantic today, a strange summer Nor’easter is dropping multiple inches of rain over parts of Maryland, Virginia and Delaware in very short time periods. In an area just northwest of Silver Spring, M.D., an amazing 3.19 inches of rain fell in just 45 minutes. A resident of Gaithersburg, M.D., I experienced a comparable deluge situation in which my hilltop residence and home office saw a river forming in its back yard. Just about an hour before, my phone was sending me warnings to avoid the valley regions. Considering the flooding we saw in the hills, it’s tough to imagine what the low-lands might have looked like. It’s worth noting that 1 inch per hour rainfall rates are considered to be extreme. But the short-period volumes of rain being produced by this system (1-4 inch per hour rates) are pretty much off the charts. It’s coming from a storm that has been fueled by an upper level trough dipping down over Canada. One that pushed a large frontal system over the Great Lakes region on Wednesday night. This front then moved across the Ohio Valley on Thursday and out over the Atlantic by Friday. Packed with cooler temperatures, the front ran over ocean waters that are ranging between 1 to 4 degrees Celsius above average. The extra ocean heat helped to create a very moisture-rich environment. A coastal low subsequently forming in this very wet column of air began cranking that moisture over the mid-Atlantic even as its associated instability produced some extraordinarily powerful rainstorms. Meanwhile, the Gulf of Mexico’s warmer than normal waters have throughout the spring and summer produced tropical levels of moisture over southern and central sections of the Eastern U.S. — fueling numerous extreme rainfall events and adding even more punch to this particular event. Already warm summer waters produce a serious amount of water vapor. But punch up ocean temperatures to the above average ranges we see today and you get even more moisture bleeding out. If an odd, deep, cool summer trough runs through it, then it provides a big kick of atmospheric instability in a region where there’s already an abnormal amount of fuel for storms. Both the ability of troughs to dig deeper over the U.S. East Coast and the added ocean heat and moisture are arguably aspects related to human-caused climate change. So to talk about this particular event without adding that context would not really be looking at the whole weather and climate picture. According to research from the Carbon Disclosure Project, since 1988, 100 fossil fuel producers have been responsible for 635 billion tons of greenhouse gas emissions. This total represents 71 percent of human carbon emissions that have occurred over the past 29 years. Companies involved in this massive carbon emission included such giants as ExxonMobil, Shell, BHP Billiton and Gazprom. The report also found that these 100 companies were responsible for fully 52 percent of all emissions since the industrial revolution began in 1751. Report authors went on to point out that this relatively small group of companies is likely to have an outsized influence on responses to climate change — hopefully adding that positive action by such corporations could produce significant positive change. However, historically, such companies have tended to fight against global climate treaties, misinform the public on dangers related to human-caused climate change, and work to delay responses to climate change within their host nations. Due to this past bad-economic-actor behavior combined with rising climate change related damages, these corporations also are exposed to what may well be a historic and unprecedented corporate liability. A far-reaching liability that could well include various harms related to climate change coming from such diverse dangers as sea level rise, loss of water and food security, loss of habitability due to heat, and damage to valuable natural resources like forests, glaciers and reefs. Already, a number of lawsuits are testing the legal waters in this regard. For example, in California this week, Imperial Beach, San Mateo and Marin counties are filing lawsuits to get some of the world’s largest fossil fuel producers to pay for sea level rise related damages. And if Imperial Beach and the two counties prevail, large corporations like Chevron, ExxonMobil, ConocoPhillips, BP and Royal Dutch Shell could be liable for billions of dollars in mitigation costs and punitive damages in coming decades even as direct damages from climate change ramp up. Attorneys for the plaintiffs said they modeled their legal tactics after past efforts to hold accountable cigarette businesses, makers of cancer-causing agents and gas and chemical companies that used methyl tertiary butyl ether (MTBE), a gasoline additive that has contaminated groundwater across the country. And though not all liability related lawsuits against major tobacco and chemical companies were successful, those that stuck resulted in major awards even as the lawsuits themselves produced a very harmful public relations impact for the companies involved. It’s an important aspect of our world. One that is essential to maintaining a stable climate and, by extension, the health of modern civilizations. Today, due to a continued warming of the globe, every form of frozen water — be it frozen water locked in glaciers, snow, or sea ice — is under threat. And we are almost daily reminded of new losses coming from these needed collections of cold. 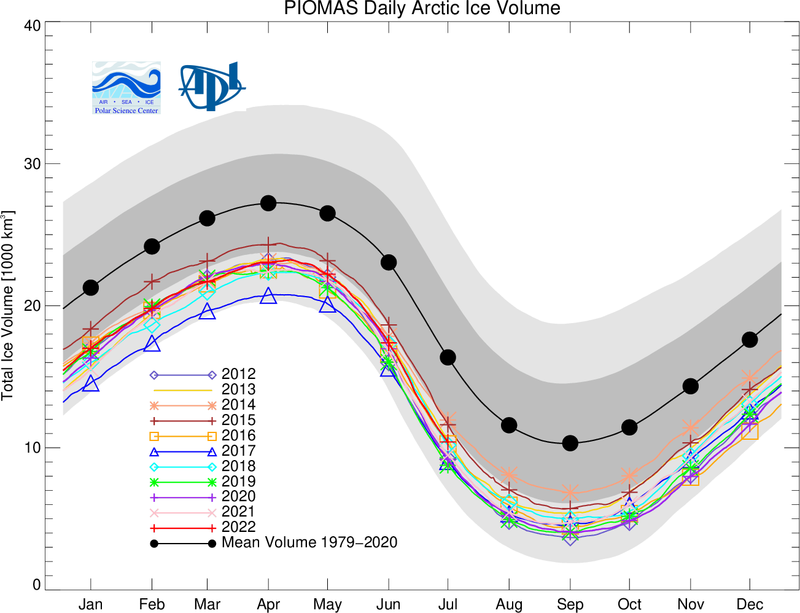 Recently, however, one of these subsets of global ice has taken a very serious blow. For this past year, as ocean and land surfaces warmed to above 1 C warmer than late 19th Century averages, has seen a precipitous fall in the coverage of global sea ice. And we are now in uncharted territory as the Earth’s sea ice extent, area, and volume have fallen to never before seen lows. Total sea ice area and extent have now ranged between 2 and 3 million square kilometers below the 38 year average for about a year now. That’s a region of sea ice larger than Greenland which has been removed from the face of the Earth now for the better part of four seasons. Global sea ice volume losses are now in the range of 12,000 cubic kilometers — each cubic kilometer roughly equal to a moderate-sized mountain. These are very considerable losses. But perhaps more ominous than the losses themselves is the fact that they seem to be sticking around — locking in a permanent warming-related-change to the Earth System, its weather and environment. To be clear, there are some things that sea ice loss does not directly impact. And the first of which is sea level rise. Because sea ice already floats on the surface of the ocean and because it already displaces water, melting sea ice does little to change the level of the ocean surface directly. That said, there are many things that sea ice loss does affect. And the first is global temperature balance. Sea ice serves as both a reflective shield that throws back the sun’s heat during summer and as an insulator that locks warmer ocean waters below during winter. Remove a significant portion of the global sea ice, as we have done, and you’ll end up with oceans that both draw in more heat during the warmer months and bleed out more stored ocean heat into the atmosphere during the winter. Such heat will be both stored and delivered exactly where it can do the most harm — in the polar regions. And, as a result, recently ice-liberated oceans will warm more rapidly in areas that are directly adjacent or close to the very large glaciers covering Greenland and Antarctica. As such, though melting sea ice has no direct, immediate impact on sea level rise, it can create an added pressure for the loss of land-bound and sea-fronting glaciers that will raise ocean levels if they melt. Arctic regions also face considerable added heat pressure to permafrost, boreal forests, and other carbon stores as a result of Arctic Ocean albedo feedbacks due to sea ice loss. In addition, warm pools of ocean water in the far north will aid in further destabilizing already-altered weather patterns. So sea ice loss is likely to continue to result in a worsening of the Jet Stream excursions that have already contributed to extreme weather — particularly in the Northern Hemisphere. But perhaps the most concerning impact of sea ice loss is an alteration to seasonal temperature exchange. More heat absorbed by oceans during summer and then ventilated back to the atmosphere during fall and winter will tend to result in a lag in global cooling into the fall season even as winter will tend to warm. Such a lag enhanced by sea ice loss is arguably already in play in the Northern Hemisphere — where increasing rates of heat exchange between the tropics and middle latitudes and the pole have already been observed. However, if Southern Hemisphere sea ice remains reduced, a similar heat exchange and polar amplification pattern is likely to begin setting up there as well. The upshot is that the observed considerable loss of global sea ice coverage is likely to produce harmful or disruptive feedbacks in the Earth’s climate system in the near term. Stresses to the other frozen systems of the world will tend to increase as a result. Extreme weather events are at risk of worsening. Rates of polar warming could escalate. And disruptions to traditional seasonality will tend to become more apparent. A little more than a year after a massive wildfire forced the full evacuation of Fort McMurray in Alberta, another set of extreme wildfires in British Columbia is again forcing major population centers to empty. In the region of Williams Lake and Cariboo City, 17,400 people have been forced to flee as a wildfire is threatening the major highway exiting the area. As the fire expands, another 27,000 in the broader province may also be asked to leave. This mass evacuation has been enough to empty large urban centers — turning them into ghost towns as fires rage through the surrounding countryside. This is B.C. 's Cariboo region. The red is under evacuation ORDER (yellow is alert). On Saturday, 40 mph winds, hot temperatures in the 90s (F), and lightning strikes fanned flames in the region — considerably worsening the fire situation and spurring more comprehensive evacuation orders. Heavy rains earlier in the year caused rapid vegetation growth. But as much warmer than normal temperatures accompanied by dry, windy conditions entered the region in June and July, the new growth has turned into tinder — adding a serious fire hazard. Presently, 160 wildfires are now burning across British Columbia. This number is down from more than 200 fires earlier in the week. However, many of the larger fires have grown in size. The result is that the province is still under a very severe alert level 4 with a mass mobilization of firefighting resources underway. On July 15, the fires were clearly visible in NASA satellite imagery (see above). Precipitation extremes and increasingly warm temperatures are a hallmark signal of human caused climate change resulting from continued fossil fuel burning. And it is these kinds of conditions that have dominated British Columbia over recent months. Both the strong swing from wet to dry conditions accompanied by much warmer than normal summer temperatures is climate change related and has likely served to increase the fire danger throughout British Columbia this year. “Fear will NOT save us; however, fear is a prime motivator to promote new thinking and different action; to change an unsustainable status quo.” — unknown source. “There are many things that motivate us. But the most powerful motivator of all is FEAR. “– Psychology Today. “Both hope and fear are great motivators, and they both have the capacity to promote growth in us, but hope creates space in the mind and heart. Fear, more often than not, restricts it.” — Joyce McFadden. When two parties seeking a good end passionately disagree over a crucial issue it is sometimes the case that one side is flat out right and the other side is dead wrong. But what is more often the case in an honest dialogue is that both sides are expressing a part of the truth and it is the duty of us, as observers, not to take sides, but to open our ears and learn as the necessary conflict unfolds. This week, David Wallace Wells painted a scientifically imperfect, but truthful in broad-brush, picture of a bleak potential worst case scenario if human beings continue burning fossil fuels while dumping such massive volumes of carbon into the atmosphere. Wells’ New York Magazine article was accurate in broad brush in that it depicted a possible worst case climate scenario where the atmosphere becomes choking and poisonous, heat becomes so great that it’s deadly to venture outside even in New York City, disease vectors multiply, breadbaskets are crushed by heat and extreme weather, and wars over dwindling resources escalate. In the larger scope, if missing the mark on a number of details, David Wallace Wells and NYMag get it right. If we don’t stop burning fossil fuels, this is basically what our future looks like. BAU fossil fuel burning ultimately looks so incredibly grim it is difficult to fathom or even talk about. And this is the gift that Wallace-Wells has given us. The opportunity to talk about something hard and necessary. To learn and understand more both about the potential coming tragedy as well as the hope we now have in avoiding it. In other words, as science-based meta-analysis, speculation, and fiction often do — Wallace-Wells’ work helped to heighten a much-needed public discourse. Such a volcanic article eliciting such a powerful response was bound to draw some pretty strong critiques. And the article, in its more specific scientific failures, begged just such a reaction. Some of the best of these have come from Dr. Michael A Mann — one of the world’s best climate scientists and top advocates for rapid climate change mitigation. The New York magazine article paints an overly bleak picture, arguing that climate change could render the Earth uninhabitable by the end of this century. Its opening story about the “flooding” of a seed vault in Norway leaves out that one of the vault’s creators told NPR “there was really no flood.” It exaggerates the near-term threat of climate “feedbacks” involving the release of frozen methane. It mischaracterizes one recent study as demonstrating that the globe is warming “more than twice as fast as scientists had thought,” when in fact the study in question simply showed that one dataset that had tended to show less warming than other datasets has now been brought in line with the others after some problems were corrected for. The warming of the globe is progressing as models predicted. And that is plenty bad enough. And this criticism was absolutely necessary — pointing out some of the places where the New York magazine article had fallen down with regards to some of its factual basis. Wells mischaracterized the seed vault flood and a recent scientific study that basically matched satellite based temperature measures with land based temperature measures. Mann also claims that Wallace-Wells exaggerates the methane feedback issue — a very touchy subject in the present science and one that researchers have yet to convincingly nail down. 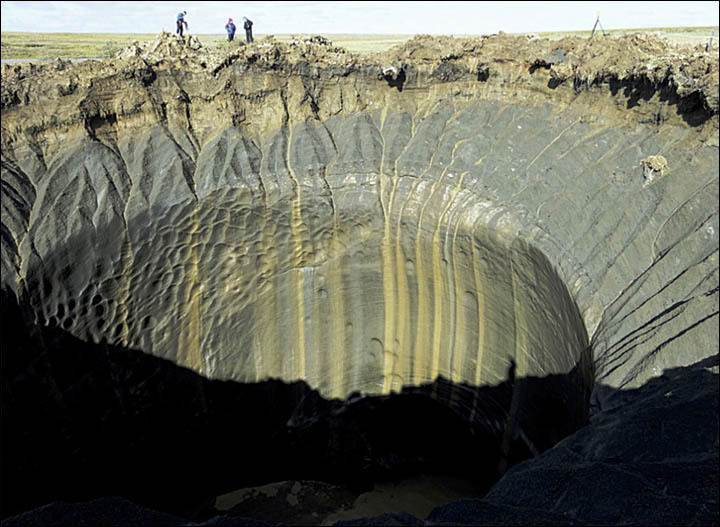 Massive methane burps are not inevitable. But they are certainly possible, and the risk grows the more the Earth warms. Loss of breathable oxygen to the extent that the article suggests is highly unlikely. But fossil fuel burning and anoxic oceans do reduce atmospheric oxygen on a smaller scale which is somewhat disturbing. And though deadly hydrogen sulfide burps from anoxic oceans are certainly possible under worst-case warming scenarios, the characterization of such events was probably a little overplayed to the minds of the more technically inclined. That said, Wallace Wells’ rolling clouds of death-inducing fog are entirely possible according to the scientific explorations of Dr. Peter Ward and Donald Canfield. In other words, the article probably leans a bit more on the darker studies of paleoclimate as an allegory for potential future harm than is comfortable to the broader scientific community — which then led to assertions that his portrayal was closer to science fiction. This despite the fact that some of the science does point to these kinds of worst case climate events that may look rather like what Wallace-Wells describes even if, as a technical matter, he’s somewhat off with regards to the present scientific consensus according to the well-informed opinion of Mann. But aside from these much-needed critiques, Mann unintentionally does us a bit of a disservice here. By comparing Wallace-Wells with climate change deniers, Mann is creating a false equivalency argument. Moreover, Mann also generates false hope in the public sphere by appearing to down-play climate risks, even though that was clearly not his intention. In truth, Wallace-Wells falls far closer to the mark than any climate change denier. And if any of the consensus science that Mann relies on for his assertions happens to be wrong or too conservative, then a business as usual fossil fuel burning future could look a lot more like the one Wallace Wells describes than present scientific consensus expects. In other words, Wallace Wells warnings may turn out to be more prophetic than an overly cautious science even if the various details of a climate disaster scenario play out in ways that few of us presently expect. The future is, in other words, murky. And you absolutely don’t want to be prodding the Cthulu that is climate change based mass extinction into full wakefullness by continuing to burn fossil fuels. Nor do you want to beg that potentially very bad future in giving ammo to climate change deniers by comparing a rather rational form of alarm with what amounts to an intentional deception that has been purposefully inflicted upon the public discourse. It is important to communicate both the threat and the opportunity in the climate challenge. Those paying attention are worried, and should be, but there are also reasons for hope. The active engagement of many cities, states and corporations, and the commitments of virtually every nation (minus one) is a very hopeful sign. But, you know, there’s great news from green energy, there’s great news from renewables, the cost of wind and solar power is falling, not just dramatically but much more dramatically than even the biggest boosters would have predicted five or 10 years ago. A lot of that has to do with subsidies from the Obama administration and other similar, like-minded countries around the world. But there is really good news there. And there’ve also been some limited progress on what’s called “carbon capture,” which are devices to take carbon out of the atmosphere, which will almost certainly have to be one big part of the equation. With electric cars, etc. there’s a lot of tech innovation that should give people a lot of hope. My hope is that readers will read the piece and feel motivated to think more about the choices they make, but also to this sort of consumption choices they make. And to agitate politically for policy options that will have a positive impact, and not think of climate change as a third or fourth order political priority, but as probably the most important issue we’re facing the world today, and one that should be at the top of our minds whenever we’re thinking about public policy at all. In other words, Wallace-Wells is not our enemy here. He may have stepped on a number of his unqualified facts, but he’s gotten the overall message pretty much right. And if he’s gotten a bit carried away in being scared over bad climate outcomes, then he’s in good company ;). Moreover, he’s passionately advocating for exactly the kinds of climate solutions that are absolutely needed and that do provide us all with a good measure of hope — if we pursue them. In other words, Wells has talked about climate doom. But he doesn’t walk the path of doom itself. These days, there’s a big debate raging in the sciences over the issue of Antarctic melt. On the one side, you have a growing flood of data indicating that many ice shelves are thinning, that surface melt is more prevalent than previously thought, and that glaciers are threatening to destabilize at faster than previously expected rates. On the other side, we still have a number of hold-outs who rightly claim that ice shelves have always calved and that many of the processes we now observe have always been in place. The scientific messengers sending these various indicators of Antarctic destabilization are cautious not to draw too many conclusions. But the data itself is pretty stark — which has been enough to produce some qualified, if very appropriate, warnings that Antarctica could be tipping toward instability far faster than previously imagined. Of course the ice shelves named Larsen A and Larsen B existed throughout human times until they were only recently melted by warmth creeping up the along the Antarctic Peninsula in both the air and the water. Meanwhile, the Larsen C ice shelf is about to shatter off a very large 5,800 square kilometer ice berg even as several smaller ice bergs also appear ready to form. This event, which is now imminent in the coming days, weeks, or at most, months, will break the Larsen C ice shelf back to its smallest area ever recorded even as it marks a period of increased instability and risk of ice shelf loss. For recent scientific assessments show that Larsen C is lowering in the water — an indication that the shelf is thinning. Furthermore, when the gigantic, Delaware-sized, ice berg and its smaller siblings break off they will take with them outer sections of a stabilizing compression arch. The compression arch, somewhat like the arch of a flying buttress, helps to balance structural stresses for the ice shelf. If it were to be compromised in total, according to glacier scientists like Dr. Eric Rignot, Larsen C would soon be adding its name to the list of various ice shelves around the world that have already fallen due to the warming airs and waters produced by human-caused climate change. As with most predictive measures, however, the present trend isn’t perfectly clear with regards to the ultimate fate of Larsen C in the near future. Some studies have indicated that the section of ice breaking off is not crucial to the ice shelf’s stability. And the sections of the compression arch that are being taken out are closer to the outer edge of the ice shelf — not representing the key central arch region. Overall, however, this story for Larsen C isn’t a good one. The shelf is thinning, it is about to reach its smallest area ever recorded, and even the loss of some outer sections of the compression arch are enough for a number scientists to express qualified concern. Larsen C didn’t show this level of instability back in the 90s or 2000s, so the overall trend here is more toward melt and instability for this 4th largest ice shelf in Antarctica. A one trillion tonne iceberg – one of the biggest ever recorded – has calved away from the Larsen C Ice Shelf in Antarctica. The calving occurred sometime between Monday 10th July and Wednesday 12th July 2017, when a 5,800 square km section of Larsen C finally broke away. The iceberg, which is likely to be named A68, weighs more than a trillion tonnes. Its volume is twice that of Lake Erie, one of the Great Lakes.